China’s joining the World Trade Organization at the end of 2001 signifies a milestone in the country’s global integration after two decades of economic reforms that have fundamentally transformed the economic organization of China. This collection seeks to identify the gendered implications within China of the country’s transition from socialism to a market economy and its opening up to international trade and investment. The changes have created greater wealth for some, while at the same time, serious gender, class, ethnic, and regional disparities have also emerged. 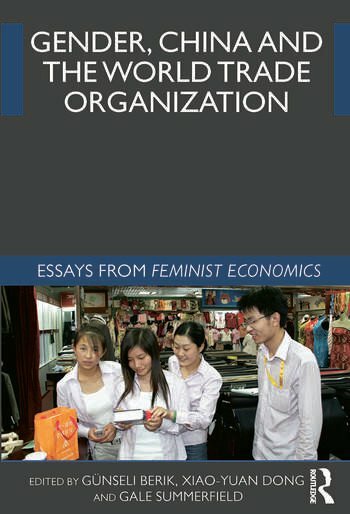 Drawing from historical, analytical, and policy-oriented work, the essays in this collection explore women’s well-being relative to men’s in rural and urban China by looking at land rights, labor-market status and labor rights, household decision-making, health, the representation of women in advertising and beauty pageants. This book was previously published as a special issue of the journal, Feminist Economics, the official journal of the International Association for Feminist Economics (IAFFE). All contributions have been subjected to the journal's rigorous peer review process and comply with the journal's editorial policies, as overseen by the editor, Diana Strassmann, and the journal's editorial team, including the associate editors, the editorial board, numerous volunteer reviewers, and the journal's in-house editorial staff and freelance style editors. The special issue and book have been made possible by the generous financial support of Rice University and the Ford Foundation-Beijing. Günseli Berik is Professor of Economics at the University of Utah in the United States. Her recent research focuses on international trade, gender wage inequality and working conditions in Asia with a particular focus on Bangladesh, China, Korea, and Taiwan; debates on labour standards; and gender inequalities in training for the skilled trades in the U.S. Dr. Berik is a Co-editor for the journal Feminist Economics, and a guest editor most recently of the journal’s Inequality, Development, and Growth special issue (2009). Xiao-yuan Dong is Professor in the Department of Economics at the University of Winnipeg, Canada, and an adjunct Professor of the China Center of Economic Research, Peking University, China. She received her doctorate from the University of Alberta, Canada. Her research focuses on China’s economic transition and development. Gale Summerfield is Director of the Women and Gender in Global Perspectives Program and Associate Professor of Human and Community Development at the University of Illinois at Urbana-Champaign. Her current research interests address gender and economic reform in China, human security (income, property rights, and health), and transnational migration.